Vicki Morgan and Gail Gaynin were good friends when they joined their agencies in 1995. 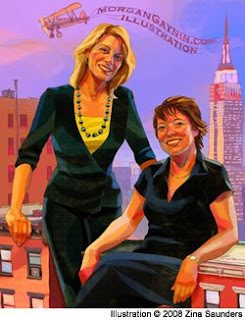 Now Morgan Gaynin Inc., located in New York City's Gramercy Park area, represents over 40 international illustrators. Most problems with assignments are a result of miscommunication. It is your responsibility to find out all that is necessary to do your job well. Having discussed literally thousands of assignments, we have a good sense of the questions one should ask to ensure clarity. To find out how the people in question feel about communications with artists, we polled some of our favourite art directors, art buyers and graphic designers from all different types of companies. It is your job to elicit these mental images during initial discussions with your AD. Be sure to understand the vision in his/her “mind’s eye”. If this is an editorial or publishing job, ask for a synopsis of the story or a run-down of the main points. Ask what aspect of your work made you the collective choice? This way there won’t be any disparity between what is expected and what you do. Know if there is a particular illustration of yours that they especially like. Artists with various styles or techniques would be wise to discuss which approach to use. The size, black and white or colour, how the finish should be submitted . Also discuss possible expenses up front so they can be included in the budget. Don’t assume time and money are padded. When discussing due dates, rather than saying “I need two weeks,” say how much time you need for the sketch and then how much time for the finish after sketch approval. You are still getting the two weeks you wanted to complete the illustration and they can plan the sketch approval time accordingly. If you are also a designer don’t be afraid to ask if you will have any say about the type treatment or design. Email, fax, in person, phone or through the rep. Sometime Ads prefer to deal with a rep… or then again, some prefer not to speak with your rep after the business aspects are settled. If this is the case, keep your rep fully informed about the creative particulars so that any problems can be nipped in the bud. Ask who among these people will have to approve your work. When you sense there may be too many options for an easy consensus, ask for everyone to sign off on your work and insist that directions be conveyed to you by one designated person. You may be a freelancer, but creating a visual for reproduction takes teamwork. No matter what your opinion is of a provided layout idea, it is always necessary to first sketch what you have been asked to provide. Often the idea you are being asked to visualise has passed through many layers of approvals and there is no flexibility for alteration. But certainly ask if you may also submit your own additional sketch ideas. Along with these sketch ideas you might consider providing a few sentences about your thoughts behind the images. This will give the AD some helpful information to sell your proposals to the less visual team members. In case there is an illness, a personal emergency or changes on another supposedly completed assignment, keep your AD in the loop and you will most likely have an advocate for rescheduling. To avoid problematic and unexpected responses, it might be wise to submit a few preliminary thumbnails and a sample finish just to be sure you are going in the right direction. Attention to these points will only add to your joy of actually being paid to make pictures.